Bobo the Baby Rabbit is playing outside with his brothers and sisters. When he gets tired he goes to rest, almost sitting on top of Emily Hedgehog. Emily is frightened so rolls into a ball, surprising poor Bobo who doesn’t know about Hedgehogs. Did you know they have prickly spikes? Emily tells him why she has them and how she didn’t mean to hurt him. 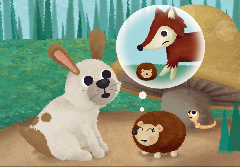 Once Bobo knows about the hedgehogs prickles he and Emily become good friends.